In the early days of brewing, the judging of beer was largely confined to casual conversations. To have drunk various beers in the places where they were made was to a man’s credit, and his tales were welcomed by those less informed, as well as those who leaped at a chance to tell of their own discoveries. In the late Middle Ages and early Renaissance, these fireside chats focused on cities and beer styles. Wayfarers might discuss the wheat beers of Hamburg, the ales of Yorkshire or the celebrated Braunschweig Mumme. A few centuries later in the young United States, travelers touted the merits of Albany ale versus Philadelphia porter, with perhaps a word or two about the upstart lager beer of the German immigrants. Comparisons pitted style against style until the late 18th century, when brewers gained enough control over the means of production to brew a consistent product on a regular basis. They could now turn their attention to competing with other brewers to win favor with the drinking public. The idea of an organized competition — where one’s beers could be compared, judged and proclaimed superior — became very attractive. Beer had been a vital part of markets and fairs for centuries; the fairs and expositions of cities like Munich, Cologne,Vienna and London were a natural setting for organized judging. 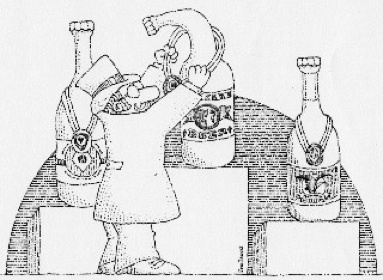 As early as 1803, brewers began taking home medals and pointing to them as proof of their product’s quality. In a world without radio or television, the fairs offered brewers their largest audience. Of course, the most avid competitors were those who sought a larger reputation and market for their beer. At the expositions, brewers entered their beers in the judging, placed them in the fair’s eating places, built lavish exhibits, passed out souvenirs and paraded their elaborate horse-drawn beer wagons, all to court the public. The most avid competitors were the “shippers,” brewers who sought a national market for their beer and who were eager to acquire a national reputation to spur their sales efforts. Anheuser-Busch of St. Louis, and Best (renamed Pabst in 1889), Blatz, Miller and Schlitz Brewing of Milwaukee were some of the era’s most famous brewers, and their beers went head-to-head on many occasions. The first major U.S. exposition was the Centennial Exposition in Philadelphia in 1876, where Americans sought to equal the great European fairs. Brewers entered their beers to win medals that would impress the public with the superiority of their products. Best Brewing won a gold medal and the highest award for bottled beer, while Anheuser-Busch took home a blue ribbon. At the next World’s Fair, held in Paris in 1878, American brewers were eager to compete. Entries came from three St. Louis brewers: Anheuser-Busch, William J. Lemp and the Joseph Uhrig Brewing Company, and they returned with gold, silver and bronze medals respectively. Milwaukee’s Best Brewing also won a gold medal, but the grand prize went to Philadelphia’s Bergner & Engel. During the next decades, Best won awards at American fairs in New Orleans (1884-1885) and Buffalo (1888). Anheuser-Busch continued its success, winning awards at New Orleans, plus Amsterdam (1883), Melbourne (1888) and Vienna (1891). More than 21 million visitors passed through the gates of Chicago’s World Columbian Exhibition, the setting for one of the nineteenth century’s most acrimonious judging disputes. On the grounds, visitors heard the brass band of John Philip Sousa, sneaked a peek at Little Egypt dancing the hootchy-kootchy and slaked their thirst with America’s finest beers. Twenty-four brewers exhibited, but the competition was led by the country’s leading “shippers,” Anheuser-Busch and Pabst, which got in the first good lick with a 13-foot square, gold-plated model of its brewery on display in the fair’s agricultural building. More shrewdly, Pabst placed its beer in the small stands and restaurants where the majority of the beer drinkers could afford to eat. The judges made things worse by issuing a judgment in favor of Anheuser-Busch’s Budweiser prior to chemical analysis and then reversing themselves after the analysis, citing the presence of salicylic acid in Budweiser and instead giving the nod to Pabst for its Blue Ribbon. Anheuser-Busch appealed and the judges then ruled there was no first prize winner. Anheuser-Busch threatened to sue and the judges voted again based on preference, putting Budweiser ahead by five-eighths of a point. Next Pabst persuaded the judges to return to their second, post-analysis point count of 95 2/9 for Pabst and 94 2/3 for Anheuser-Busch. This became final, 10 months after the initial judging, when the executive committee of the fair refused to examine the matter any further. But the dispute dragged on. In the spring of 1894, Adolphus Busch sailed to Europe and obtained a sworn statement from one of the judges that there had been no salicylic acid in Budweiser. But upon his return, the commission refused to reopen the controversy, perhaps influenced as much by exhaustion as by strength of character. The venerable Busch contemplated shunning future competitions altogether, stating in a letter to his son, August A. Busch, that awards should be based on the merit of the beer and not upon money and stratagem. But Anheuser-Busch continued to use its medals on labels and special posters distributed to the trade. While yearly sales figures showed no precise correlation between victory and sales increases, the major brewers of the day obviously felt such battles were worth waging. In 1896, Pabst sent beer to Leadville, Colorado, for a local fair, where its beers competed against those of Philip Zang, the Neef brothers and Adolph Coors. The highlight of the fair was an Ice Palace featuring bottles of Coors frozen in the ice blocks. Some workers decided to sample some of the extra bottles sent by the Golden brewer but to their dismay found the bottles were filled with salt water to prevent breakage when frozen. The numbers can be explained. Every exposition was dependent upon the participation of industry. The more exhibitors, the greater the attraction, the greater the attendance, the greater the return. It would have been impolite and impolitic to send home an exhibitor, especially one who had brought products and an exhibit from across the Atlantic, without some honor, some quid pro quo for their participation. And so the judges awarded hundreds of prizes, all of which could be used for advertising and promotion. Because so many medals were awarded on so many occasions, and there were so few national media, many local and regional brewers were able to claim, without fear of contradiction, that their beers had been victorious. For example, the John Gund Brewery of LaCrosse, Wisconsin, boasted of winning “top honors” with Gund’s Peerless at the Paris competition. The St. Louis World’s Fair of 1904, also known as the Louisiana Purchase Exposition, was hailed as the grandest of the era. The Pabst Brewing Company, working on the assumption that they didn’t have a penguin’s chance in Hell of winning in Anheuser-Busch’s hometown, augmented their liquid entry with a navy-blue brewery wagon, with red wheels, drawn by a six-horse team of dapple-gray Percherons in gold-ornamented harness. To further showcase their beers, they built the lavish Pabst Jai Alai Cafe & Roof Garden. Not to be outdone on their own turf, the St. Louis brewers combined to set up a Tyrolean Alps concession complete with mountains, castle and a huge restaurant pavilion. The following year, the Louis and Clark Centennial Exposition was held in Portland, Oregon. Eastern brewers exhibited their beers, but it was locals like the Henry Weinhard Brewery and Olympia Brewing, with its Swiss chalet, that were most prominent. In the years before World War I and Prohibition, the brewers’ participation in the great expositions declined, but the notion of a national beer judging never died. The Great American Beer Festival has recaptured much of this history, starting off with an innocent air and a consumer preference poll in 1983, then grappling with the inevitable problems occurring as brewers found that victory at the Festival could lead to financial success and survival in a competitive marketplace. The Festival evolved to meet the challenges and in 1987 introduced a professional taste panel to lift the judging above politics and marketing, and truly judge the beers on their merits. The success and proliferation of brewing competitions testifies to the fact that many people have something to gain from them. In spite of the talk of “medal fatigue,” the judging, entries and awards continue to increase. What drives the phenomenon? Ego, commerce and a love of beer. Brewmasters labor in obscurity, strive for excellence and appreciate some recognition. An awards ceremony is a chance to travel, visit with far-flung colleagues, eat well, and soak up some well-deserved applause. Brewery owners and marketers love competitions because awards sell beer. The testimonial is the most powerful form of advertising and a gold medal stands tall, an objective assessment in a world of subjective hype. The more reputable the competition, the more powerful the testimonial. Organizers love competitions because they are doing the industry a great service, and can tell everyone else where to sit. Also, they secretly enjoy logistical nightmares and revel in the company of disgruntled also-rans. Finally, beer drinkers love competitions because they point the way to wonderful new beers and remind them of classics they haven’t enjoyed in years. Unlike the parched travelers of the 1960’s and 70’s, today’s beer drinkers are faced with a dazzling array of beers and beer styles. By sorting out the excellent from the merely good, today’s competitions save time and money for the consumer, and elevate the beer drinking experience for everyone. This piece was written for the program of the Great American Beer Festival in 1987, rewritten for the Spring issue of Zymurgy in 1988, rewritten again for All About Beer in 1996, and edited again in 2011 and 2012. The illustration is by Ken Renczenski, to whom I am eternally grateful. The section on the 1900 Paris exposition was especially interesting to me as I’m presently researching the Gund Brewery. Thanks for including that perspective, it is useful and fascinating. Delighted to be of some use. Good luck with your research!